Previously broadcast as part of the renowned BBC TV Arena series, Alone With Chrissie Hynde follows the Pretenders’ lead singer as she shares an insight into her life. 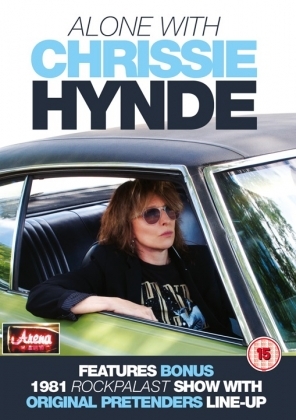 On a journey taking in Paris, London, New York, Nashville and her hometown of Akron, Ohio, Chrissie takes the lead, avoiding the talking heads typically associated with documentaries to speak frankly about her passion for music, painting and the issues that matter to her most. “People that are careful about looking like they don’t care have another level of caring” says Hynde, as she stocks up on some men’s tailoring in a Parisian store and relaxes in her Paris apartment, sporting a tourist style t-shirt (“I never pack what I need”). While in her London home, overflowing with her paintings, she picks through some of the records that influenced her most. At George Harrison’s Bhaktivedanta Manor Hare Krishna Temple she milks a cow, before rocking up on stage for a guest spot at a tiny West London pub. Of touring and playing shows she says, “It’s about feeling like you actually know what you’re doing for an hour, the rest of the time you’re bumbling around trying to make sense of your life”. Although she admits to youthful shyness and years of stage fright, it’s hard to imagine Hynde ‘bumbling’ anywhere, she seems more purposeful than that. Her ability to seek beauty where others might see blandness and decay speak of a songwriter’s sharply observant nature. The unseen interviewer is even briefly questioned, frozen in the headlights of Hynde’s unfaltering gaze. A lone walker along an American highway in vegetarian ‘leather’ boots, while the cars whizz anonymously past her... Wandering in her hometown cemetery, marvelling at the headstones, “I like to say their names out loud because I think - when was the last time anyone said your name out loud?” she muses. There’s coverage of the band in Nashville during the recording sessions for the Alone album and live performance clips tracks from the album, as well as archive footage of classic tracks such as Brass In Pocket and Back On The Chain Gang. Complementing the film is a bonus full length concert performance by the original line-up of the Pretenders from the Sartory-Säle in Cologne, Germany from July 1981, which was filmed for the famous Rockpalast music TV series.